I'm sorry to have to say but after this post I'll be in hiatus again indefinitely until I can find time. Lots of things have not been going my way and I'm really unhappy but I'm glad to say I've got over it. It's spring now so I'll try to post more recipes and desserts using flowers and fruits as base, if I can find some time of course. This chocolate french toast is what I had for breakfast. Not very healthy but I quite like it. You just need to indulge once in a while. I like it, a new twist to normal french toast with the addition of cocoa powder. Mix everything together except the bread of course. I would sift the cocoa powder through a tea strainer the next time I make this again. Soak the trinagles in the mixture (hopefully you've already think a step ahead and had the mixture in a shallow bowl) and pan fry them with generous amount of butter on both sides until done and set. You probably won't see it turning golden brown. Drizzle with more maple syrup or go crazy like me and drizzle with sour cream ganache and a light sprinkle of crumbled toasted walnuts. You're good to go! 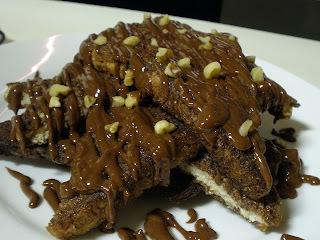 3 comments on "Chocolate French Toast"
You have this for breakfast? So chocolaholic! Anncoo- Chocolates really makes me happy and active!